FAB FRIDAY #145 WITH BOTANICAL BUTTERFLIES PAPER! Continuing with the Botanical Butterflies Designer Series Paper series for this week. I have another cute card with this gorgeous paper. How pretty are these butterflies? You don’t need much to put together a card when you have paper like this. I went for the colourful butterflies print for this card. The black and white diagonal stripe paper at the sides are the reverse of this print. I simply cut 2 strips to run along the edge of some Lemon, Lime Twist card and then adhered them both to the back of the paper piece. To put the card together I used a card sketch from Fab Friday #145. You can see that sketch -> HERE. Watch out for another project tomorrow – and it’s our Wednesday’s WOW! project so be sure to stop by. 12 Days left for Sale-A-Bration! Have you got your free products yet? SO HOPPY HALF FOLD CARD! I have a bright, happy card for you today. I wanted to create some more with this fun Sale-A-Bration set So Hoppy Together. I have made a few cards recently. If you missed them you can click on the tag ‘So Hoppy Together’ down the bottom. For the card I cut off about 3cm (1 1/4″) on the front panel. The cheery paper is from the How Sweet It Is DSP pack. I had JUST enough of that paper for the front. The frog is stamped in Memento and coloured with the Stampin’ Blends. Of course, I used the Layering Circles Framelits and the Stitched Shapes Framelits. These don’t move too far off my table. The little tag is from the Wood Crate Framelits. It’s just the right size. The card was inspired by THIS card here but I decided to cut the card down and changed it around a little. Here is the inside. I stamped the flies down the side. Cute but in real life I don’t like being in a swarm of flies especially with those bulging eyes. 🙂 The sentiment is from Amazing Life. You can still get the So Hoppy Together stamp set but not for much longer. 2 weeks left for Sale-A-Bration. The Hop Around Framelits are still available here but in short supply so if you want them Get Them Now. NOTE: These are additional products to purchase not a Free Sale-A-Bration choice. Available for $47 AUS. You can order in my store -> HERE. Please use the Host Code JQGFKFT9 Don’t forget to choose your Sale-A-Bration item. Also, with your orders over $78 receive the Tutorial Bundle for 12 exclusive Projects. All orders receive a little card and gift to say Thanks. 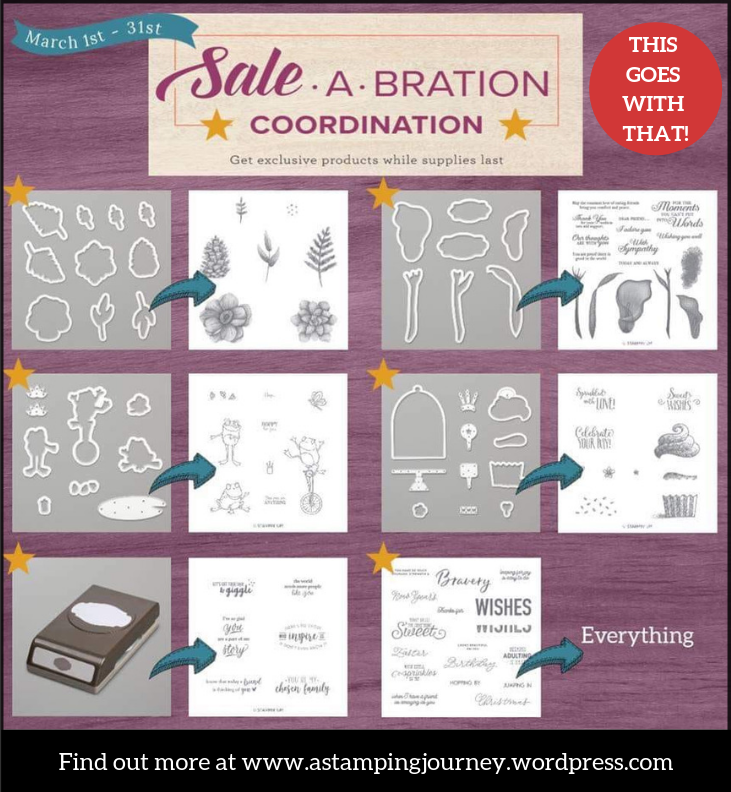 BECAUSE YOU WANT MORE FOR SALE-A-BRATION! Have you enjoyed the Sale-A-Bration choices so far? Are you wanting more choices?? I think so. From today you can. There are some absolutely gorgeous new items. Let me show you. These products below are available to choose as your free choice for orders over $90. Some lovely medallion style stamps. Aren’t the sentiments just lovely? “You are pretty much the BEST ever”. I think I could use this on a few cards for some special people. Here is an idea with the corner stamp. Using the Stamparatus it makes it so easy to line up. I will share a video on that soon. Look at the detail in this folder! You can colour the embossed impression with some Blends ink and sponge. That is a great way to add colour. This has to be my all time favourite. 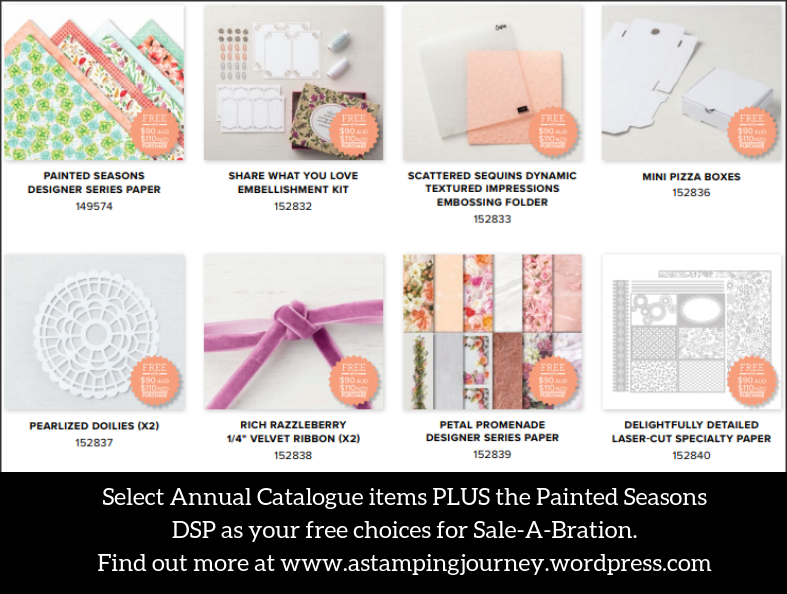 The stamp set and the paper below are available as your free choice Sale-A-Bration item for orders over $180. This paper is ABSOLUTELY GORGEOUS! I will share some projects with these soon. Look at these gorgeous samples. So what do you think? Love them??? OK, so now off you shop. Let’s go. Head HERE to my store. Be sure to choose your Sale-A-Bration choice after you order. REMEMBER, orders over $78 AUS will also receive my Tutorial Bundle for the month which includes 10 project Tutorials for you to create. You will love them.